The Laboratory Automation Technologies (LAT) is a Core Research Facility (CRF) at DZNE in Bonn and was initiated in 2010. The LAT has established a state-of-the-art automated screening platform consisting of more than thirty different instruments under cleanroom (ISO-5) containment level. The platform can be used for fully automated multi parametric image-based assay and all types of common biochemical and homogenous cellular assay approaches. The LAT facility is the repository of chemical and genomic libraries, including 80k small molecules, murine and human genome-wide siRNA libraries and human miRNA libraries. Internal and external scientists can use these libraries for their screening projects. The LAT work in close collaboration with the IDAF for image analysis, statistical computing and data mining and the LMF for advanced microscopy. Our LAT staff has a broad scientific and technical background in High-Content Screening, laboratory automation and statistical computing to ideally support your projects. The LAT operates on a cost recovery basis. DZNE members, collaboration partners and external research groups or companies can apply for a screening or automation project. Personal meeting with LAT staff to discuss the project (scientific background, assay set up, assay development, libraries etc.) and to explain the booking/charging system. Customers have to complete the “LAT project request form” (form A, link to pdf.file) and “application form for DZNE core facilities” (form B, link to pdf.file). Customer information will not disclosed to any third party at any time. LAT staff will provide a quotation based on form A. Fully automated plate and tube storage system with remote sample access, integrated database and Tube Picker system for the consolidation of tube racks or tubes cherry picking. The instrument has temperature range control between +20°C and -20°C and possibility to store 520 plates or 49920 Tubes. Two automated incubators with a plate shuttle system are integrated into our screening platform. The first incubator has a temperature range between 20°C (RT) and 50°C. Second incubator has the additional cooling cryostat enabling stable control of temperature range between 4°C and 70°C and an additional function for O2 control. Both incubators have capacity of up to 189 standard microplates and stable CO2 and humidity control. This set-up enables us to perform continues live cell assays under precisely controlled environmental conditions and scheduled automated imaging. Automated ambient storage device with a plate shuttle system that offers storage for up to 189 standard microplates, tip boxes, tube racks etc. Automated Capper/Decapper that can remove and replace screw caps at once on 96- and 24-format matrix tubes in only 10 seconds/rack. 2D barcode reader controlled through the automation system that can read both single tube and full 2D rack format. For microplate labeling and tracking, adopted for four-sided label application. High speed, fully automated thermal sealer. For removal, storage and replacement of lids on microplates. Six delidder instruments are fully integrated in our automated screening platform. Allows precise dispensing over a 0.5µl to 2500µl range into 6 to 1536 wells microplates with minimal dead volume and back-flushing function. Multidrop Combi utilizes autoclavable 8-channel dispensing cassettes. Four instruments are fully integrated in our automated screening platform. 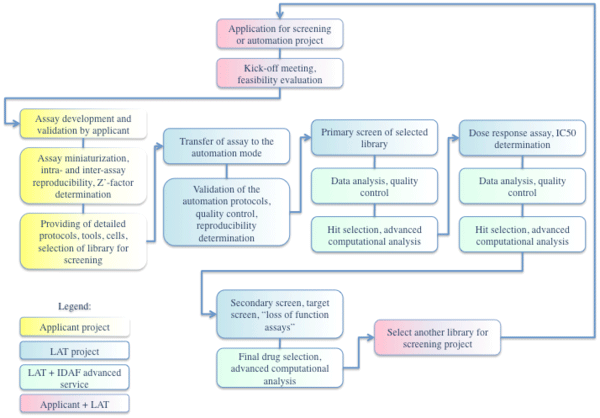 Compound collection of pharmacologically active small molecules with known primary targets (ca. 2,4K compounds). Synthetic small molecule libraries from Chembridge collections (42K compounds). "Small molecule" screening from the LAT library collection. "Loss of function" siRNA screening. "Loss or gain of function" miRNA screening. Dose response assays of "cherry-picked" compounds, siRNAs or miRNAs.